Our lifestyle habits don’t help: leaving lights on when we leave rooms, forgetting to turn off televisions or computers when not in use, and running appliances when it’s more expensive all result in wasted energy and higher costs. Changing these habits can help save energy, but that’s easier said than done. Fortunately, many homeowners are turning to smart technology to save energy. Here’s how you can do the same. Smart technology allows homeowners to take control of their energy usage through a variety of smart-home energy-saving strategies. Smart-home hubs can turn appliances off completely when not in use, eliminating the energy drain caused by “idling” appliances and improving energy conservation. The DoE reports that, despite being 30 percent larger, homes built after 2000 only use 2 percent more energy than older homes. In large part, this is because newer homes are more likely to be built with smart-home energy efficiency in mind, including smart-home hubs and appliances. For smart homes, new energy-saving technology is typically controlled via smartphone apps, so you can turn devices on and off even when you’re out of the house. These technological advances allow homeowners to implement new strategies for lowering both their home’s energy use and their utility bills. 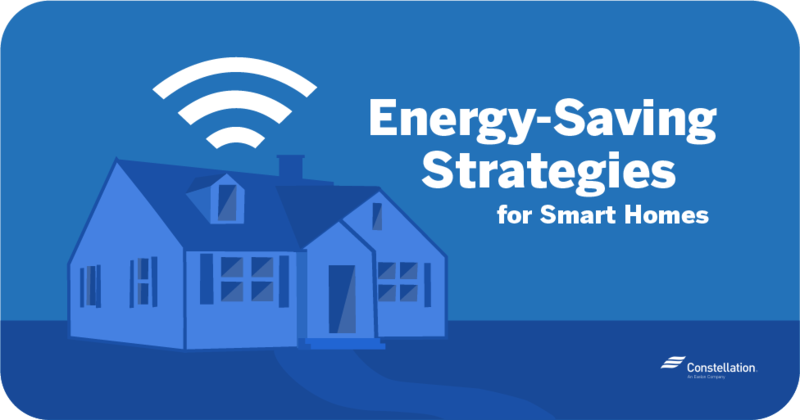 What are the best smart-home energy-saving strategies? Home automation allows homeowners to control their appliances through smartphone apps, creating many new ways to save energy. Here are some of the best energy-saving strategies for smart homes that you can use today. Simplify your day by setting smart-assistant routines. Choosing Google Assistant or Alexa smart-home assistants allow you to create daily smart-home routines, scheduling when appliances turn on and off. For instance, you could set smart kitchen appliances such as dishwashers to run while you’re out of the house, or you might schedule your coffee machine to turn on and off at the same time every morning. Such routines mean you don’t have to worry about forgetting to turn off appliances when they’re not in use, and improve smart-home energy-efficiency. Operate your appliances during off-peak times to save on energy. Dishwashers, washing machines and clothes dryers often run at the same time in multiple households across an electrical grid, creating peak demands for energy at certain times of day. Homeowners can reduce energy use by creating smart routines for washers, dryers and other appliances, scheduling appliances to run at times of day when energy demand is low. Use automatic power downs to stop appliances from wasting energy. Many appliances consume energy even when not actively in use. Gaming consoles, standby coffee makers, cable or satellite boxes and any device that can be operated by remote control consume power when not in use. Using automatic power-down modes prevents inactive appliances and devices from draining energy. Pro tip: If you’re unsure of how much energy an appliance consumes, Energy.gov has a useful appliance energy calculator. Space heaters. Space heaters operate at an average of 750 to 1500 watts. Improve your smart-home energy savings by scheduling timers to automatically power down heaters. Air conditioners. Air conditioning accounts for 17 percent of the average home’s energy consumption, and most air conditioners run more than they should. Reduce your heating and cooling costs by linking your air conditioner to a smart thermometer for maintaining your ideal home temperature. Lighting. Lighting consumes 10 percent of a home’s energy. Switching to energy-efficient bulbs only costs you 11 cents per kWh to run, but even LED light benefits can waste energy if left on. Using motion detectors and timers to turn off lighting are two of the simplest energy-saving strategies for smart homes. Clothes washers and dryers. New energy-saving technology for homes allows you to control when appliances operate so that you can schedule them to run when energy demands are low. Cooking appliances. Even when kitchen appliances are not in active use, the displays on microwaves, ovens and refrigerators remain on and consume power. Smart tech can send appliances into power-saving modes, turning off displays when a device or appliance is not in use. TVs, computers and gaming consoles. Leaving computers, televisions and gaming consoles on when not in use wastes energy—energy a smart assistant can save by triggering automatic power downs. Dehumidifiers and humidifiers. Dehumidifiers and humidifiers are often left to run all the time. Using smart assistants to turn off such devices when no one is home provides smart-home energy savings while keeping the home at a comfortable humidity level. Analyze your home’s energy use with smart home-energy apps. 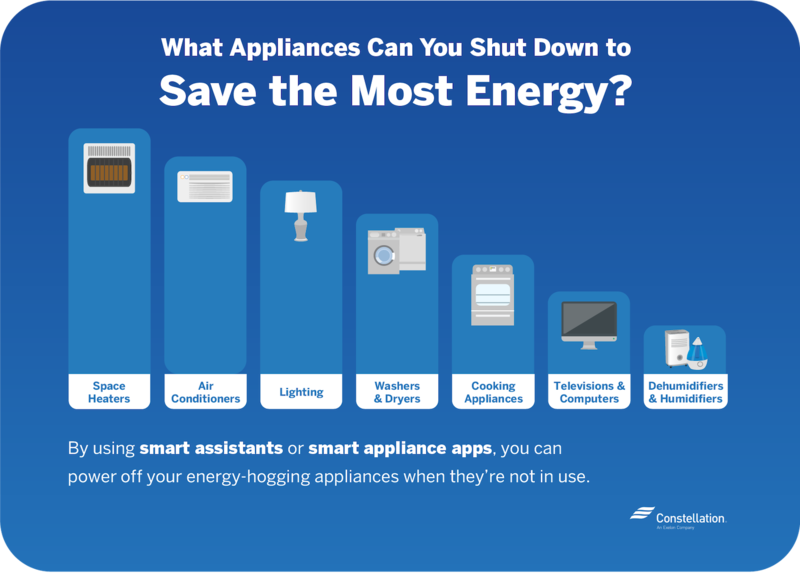 To take full advantage of smart-home energy-saving strategies, you need to know which appliances and devices consume the most energy and when they’re most often in use. Home-connected apps (such as the DoE’s Home Energy Saver) monitor and analyze energy use to show homeowners which of their appliances are consuming the most power. Save energy with voice-controlled smart lighting. Smart lighting includes any lights that can be controlled by a home’s smart assistant or through the smart light’s phone app. Homeowners can set up energy-efficient timers, motion detectors and dimmers to change the lighting at set times throughout the day. Once linked to a smart assistant, such lighting can be turned on and off through voice commands. Smart lights offer other benefits. Scheduling lights to come on and off when you’re not home can be part of an automated home security system, deterring burglars by suggesting the home is occupied. Switching from traditional incandescent light bulbs to energy-efficient LED or CFL bulbs also saves energy. While slightly more expensive than traditional bulbs, LED bulbs last much longer than incandescent lights, making them a wise investment. Install smart thermostats to make your heating and cooling more efficient. Heating, ventilation and air-conditioning systems (or HVAC systems) account for 32 percent of the average home’s electricity consumption, according to this 2015 Residential Energy Consumption Survey, published by the U.S. Energy Information Administration. HVAC systems waste considerable amounts of energy if left running when no one is home, so automated thermostats are important smart-home energy-efficiency tools. A smart thermometer tracks the home’s temperature and adjusts temperatures depending on whether the home is occupied. Consider upgrading to energy-efficient appliances for more energy savings. Smart refrigerators. Energy-efficient refrigerators save energy by analyzing internal temperatures and adjusting the thermostat accordingly. In addition, smart fridges make your life easier by scanning fridge contents and automatically ordering food when supplies run low. Smart dishwashers. Smart dishwashers can be controlled from smartphone apps and scheduled to run at specific times. Newer-model dishwashers also detect leaks and dry dishes much more efficiently with lower energy requirements. Smart ovens. With flexible features and built-in Wi-Fi technology, the newest smart ovens make cooking fast and efficient. A smart oven can even notify you when dinner is ready to serve. Smart air conditioners. Home connectivity makes it possible for you to control your smart air conditioner by app or voice command, and you can set the air conditioner to turn on before you arrive home. Sprinkler controllers. Smart sprinkler systems may not save much energy, but they can dramatically reduce your water bill. Sprinklers can be controlled from anywhere using smartphone apps, and they can be scheduled to operate at times that maximize water conservation, such as at night or in the early morning. As homes trend towards interconnectivity and the Internet of Things continues, more devices and electrical products are becoming smart. This trend is especially prevalent in the kitchen, where smart kitchen gadgets such as coffee makers, slow cookers, scales and more make life both more convenient and more energy efficient. Use smart plugs to turn any electrical product into a smart device. Few homeowners can upgrade all their gadgets, devices and appliances at once. Fortunately, with smart plugs, you can turn any electrical product into a smart device. Smart plugs can be controlled from your smartphone or linked to your home assistant. Once installed, the best smart plugs can turn devices on and off while also monitoring each device’s energy use. We hope these energy-saving strategies for homes help reduce your energy consumption and, by extension, your utility bill. Smart homes offer many ways to improve appliance efficiency and prevent energy waste, giving homeowners control over their appliances like never before.